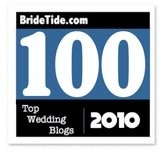 Relentless Bride® Weddings, Wedding Planning, Life & Marriage: Try Before you Buy!!! This should be every bride's motto and luckily for you, MagnetStreet Weddings is giving you that chance to do that with your Save the Dates. MagnetStreet Weddings is now offering Personalized Save the Date Magnet Samples. Get your favorite design off the screen and into your hands! 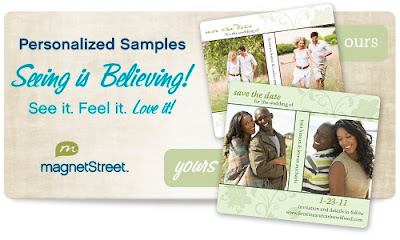 They’re celebrating by giving 1 FREE personalized Save the Date Magnet sample to the first 50 Relentless Bride readers 4/11/11-4/17/11! Order a Personalized Sample of your favorite design to see the difference and to feel the quality. Personalized Samples are available in Classic Magnets, Mini Magnets & Photo Booth Magnets. Choose your Save the Date design. Select a quantity of one. Personalize the design with your colors, photos, fonts and wording. Brides Talked. Over and over, we heard from our brides, that what they wanted—was to see a sample Save the Date with their colors, photos, fonts and wording on it. MagnetStreet Heard. Brides can now get what they’ve always asked for… personalized Save the Date Magnet samples! 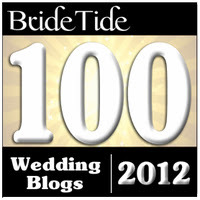 It’s brand new, exclusive to MagnetStreet and a true value-add service to brides who want to see before they buy!